← Contextualizing Bihar: What’s Going on in the Neighborhood? Itâ€™s been pouring cats and dogs in Bombay. Roads are flooded, potholes are rapidly multiplying, and traffic has come to a standstill. Or at least been reduced to a very slow crawl. Meanwhile, Hurricane Irene continues to wind its way along the east coast of the United States, causing flash floods, destroying valuable property and necessitating evacuation. Maybe a user-centered redesign could help solve some of these issues and lead to better designed cities – not even necessarily to make them more live-able, but simply more functional. On the other hand, it could be that cities need to be designed like airports, with modern, state-of-the-art design solutions. But somehow, it doesnâ€™t seem likely that that would work – you can design an airport to be quietly efficient and smooth-functioning using technology and high design, but not whole cities, especially not the delightfully chaotic cities of India. 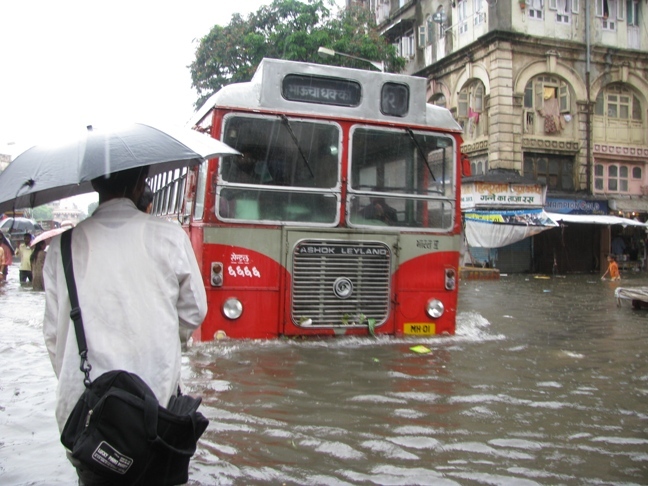 This entry was posted in Design Challenges, Design!publiC and tagged Bombay, cities, climate change, design, hurricane Irene, monsoon, Mumbai, user-centered design. Bookmark the permalink. One Response to What Happens When It Rains? The problem isn’t lack of design or anything else. The problem is that there isn’t enough infrastructure. The city needs to invest in things like storm drain networks and other drainage schemes that are appropriate to cope with a very large storm. This is expensive, for sure, but when a city grows beyond a certain size and a certain level of wealth, you just have to have it, because the cost of the disruption caused by flooding is just too great. With modern methods though, the cost is just not that big. Plastic pipes make it fast and cheap to put in new drains. If you don’t have a way of draining water out of low spots, you can tunnel relatively cheaply nowadays to get the water out. You can get finance in international markets and through the providers of this infrastructure.